Jessica Droste Yagan is CEO of Impact Engine, a venture fund that invests financial and human capital in early-stage, for-profit technology businesses that are improving education, health, economic empowerment, and resource efficiency. Prior to Impact Engine, Jessica led strategy and alignment of global sustainable sourcing at McDonald’s and consulted with city, nonprofit, and corporate clients in the areas of strategic planning, corporate social responsibility, and inner city economic development. 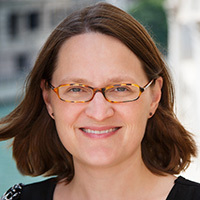 She has co-authored two Harvard University case studies on public-private partnerships and currently serves as a board member for Metropolitan Planning Council, Social Venture Partners Chicago, OneGoal Chicago, The Honeycomb Project, and Piece & Co. Jessica earned recognition on Chicago Crain’s 40-Under-40 list in 2013 and served as a 2014 Leadership Greater Chicago Fellow. Jessica holds a Bachelor of Arts in Public Policy from Haverford College, an MBA from the Stanford University Graduate School of Business, and a Master of Public Administration from the Harvard University Kennedy School of Government. She lives in Chicago with her husband Sam and three children.